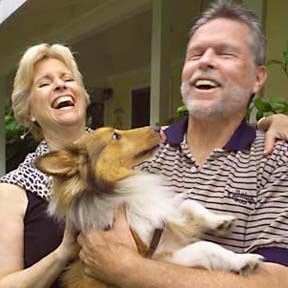 Karla Brom and John Proud enjoy a laugh outside their Manoa home with their Shetland sheepdog, Sam. Proud is in his mid-60s; Brom is in her early-50s. The 50-plus singles crowd is a hot market for Internet dating services; it is also the focus of the second installment of the Star-Bulletin's Young at Heart series.